Failed wax rings undetected will result in damage to the flooring and sub structures. Especially if over a crawl space. 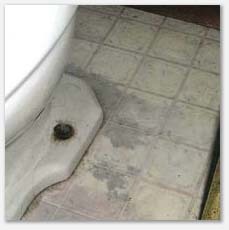 We check all toilets for proper attachment to flooring and check for evidence of leaking. If a toilet moves at all, the wax ring will become compromised over time. A toilet that runs can waste large volumes of water and result in a large water bill. During these inspections we also note cracked ceramic, bolt covers, proper function and leaking supply lines. Stains in the flooring will often indicate leaks not apparent. We carry a moisture meter that detects water soaked wood around plumbing fixtures.